Mom's Gone Bronson! : Epson XP-410 Small-in-One Printer! A MUST-HAVE in Back-to-School Essentials! 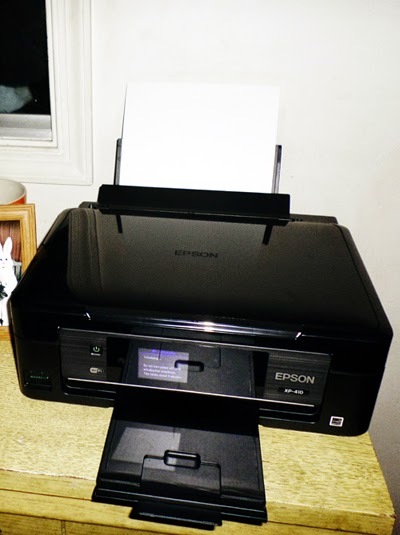 Epson XP-410 Small-in-One Printer! A MUST-HAVE in Back-to-School Essentials! I have had a week or so to try out the Epson XP-410 Small-in-One Printer/Scanner and Copier and I can't describe how in awe I am of this machine! First of all, the Epson XP-410 has some serious style, with its glossy exterior and black finish! It looks great in any space AND you really can place it anywhere within rage of a wireless router as the printer doesn't have to be connected up to your computer with all those crazy wires that are a thing of the past! The XP-410 Small-in-One Printer/Scanner and Copier has a nice, large, display on the front for easy maneuvering and simple-to-operate actions. You can scan and print straight from the machine and you can print photographs directly from your SD memory card in no time, making this an all around smart machine to consider for school projects and work essentials! I have to say, I haven't had to scan anything in a long while, but I scanned through my children's certificates that they received from the hospital when they were born, with their footprints on them and I was impressed with the speed that the XP-410 scanned! I tried to print out some photos and those, too, came out nice, clear and detailed, while printing on selected copy paper, fit for the job! In fact I printed out one of my son's groups of friends and he was happy to have it for his wall! Great quality and would be a wonderful way to gift to relatives or to make your own photo-cards for all occasions! Another feature that stands out and sways a more positive reaction is the separate ink cartridges for colors! I love that if I run out of one color alone I can just go out and pick up another! I don't have to wait until all colors are depleted and I don't have to fork out a ton of money all at once for ink if I just need a specific color! This printer looks great, runs fast, can be wired or wireless, prints great photos, scans and copies at a very quick speed and is ideal for everybody in the house! This is a great printer for a teen if you are going to invest in a new one as they return to school this year - their projects, essays and photos of the year as it goes by are going to speak volumes and allow them to give their best - it also looks great and up-to-date for every genre! I like that it is simple, fresh and clean and that it turns off after a while of inactivity - especially as teens tend to get quite distracted in the middle of something and so might leave it on (ok, I might, too, I do have the memory of a sieve sometimes!) 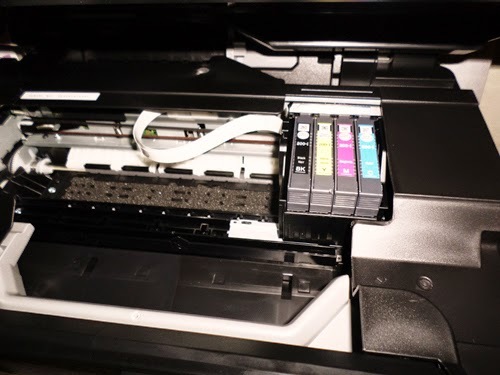 - I should also mention that the Epson XP-410 makes printing straight from your iPad, iPhone or Android tablet a synch with Epson Connect! 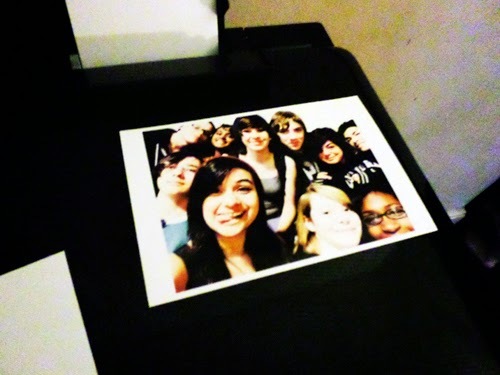 I have printed photos, made art projects, scanned AND copied as well as tested out several different sized papers, cards and photo papers for this machine. I have printed in black and white as well as color and the only issue I had was with one photo that printed out in portrait when it was meant to be landscape and that was human error, so that one lands on me! Some bonus that are useable via the printer interface, without having to set foot near your PC, are templates for lined paper, graph paper, calendars and custom note paper! Perfect for home-schooling, organization, school work in general or something for the office, all right there, with a few clicks of a button! Available at all good retailers of electronics, and at www.epsonstore.com for around $99.99, this little guy packs a powerful punch and it really does deliver! For more information, why not head on over to www.epson.com, today and take a quick look at the many features and benefits hidden away in the XP-410 Small-in-One! When you are ready, why not also connect with Epson America on (Facebook.com/EpsonAmerica) and Twitter (@EpsonAmerica) and I am pretty confident that you won't be disappointed! I know I am most certainly the happiest I have been with a printer/scanner/copier in a long while, and so is the rest of our household! *Disclaimer: I was given an Epson XP-410 to try out in return for this review. All opinions are open, honest and my own thoughts and feeling on my own, personal, experience with this particular machine. Your views may differ from mine! Thank you! I lobe the sleek look and the quality of the photo. Wireless is the way to go! This printer is beautiful! I love wireless printers, they are so smart and so much easier than a printer with wires. I have so many photos to print that it's insane! I may actually get them all printed though if I had this, instead of waiting until my kids graduate high school (& my youngest is two!). OH MY GOSH! This printer looks beautiful. I used to have a color printer but it has been many, many years and I desperately want one again. The pictures look so clear. How technology has advanced over the years. I would definitely have to price out color cartridges but will be looking into this bad boy! I have been looking at new printers... I really wanted something that was quick, and I also wanted separate ink cartridges! I might give this one a try! I am an Epson devote. So much so that hubs has his own bulky HP and I have my Epson Photo. It is just about time to replace and now I've found the one. Thank you for sparing me some shopping drudgery! Thanks for sharing this review. I am actually in the market for a new printer! I love my printer but I miss that color. I am considering a second one to print pictures and such. 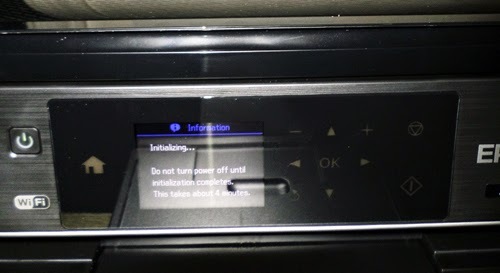 We have an Epson here at home and I liked it until it ran out of ink. They don't make the model of the one we have sao there is no ink available. We replaced it it with something else. Yours sounds really good! There is nothing better then a REALLY good printer for all your printing needs!